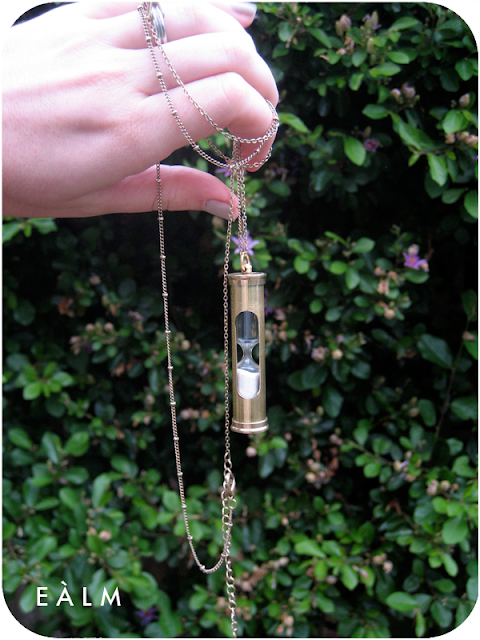 I ordered this spiffy timepiece from Nasty Gal the other day, I am so excited about it. The chain is a perfect length with enough of a drop to let the hourglass sit exactly between chest and navel... where pendants tend to look best on me, considering that shorter necklaces are challenging with a full bust. I was waiting for a smoothie to be made for me the other day when I was timing the length of the sand's measurement. Turns out it's fifteen seconds. An odd allowance, considering that most timepieces are at least thirty seconds to a minute or two... but still I love it. It's quirky! And everyone that has noticed it in the past few days around my neck has made note of how cute it is too... this one's a definite crowd pleaser. Be ready to see it more in upcoming posts. For questions on accessorizing, ask here on my Facebook wall.